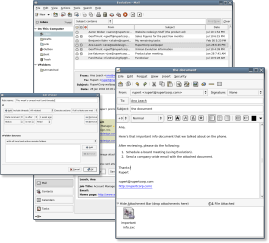 For those of you that use Linux, especially those that use a Gnome-flavored distribution, you should be familiar with Evolution; the greatest e-mail client I’ve ever used. For the rest of the world, I want to share this amazing application. 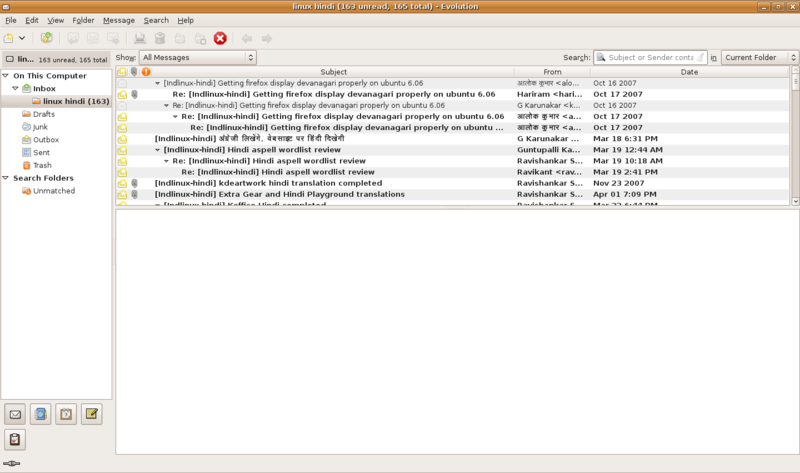 Though there is a version of Evolution available for Windows, I have not yet used it, so all of my comments in this article will be based on the Linux version. I cannot say for sure whether or not the Windows port has the same features, but I am hoping that it does. So, what does Evolution do? Well, I think it might be easier to try to list the things related to e-mail that Evolution doesn’t do, but at the moment I can’t really think of any. However, I have also noticed some other great features that are not listed on their site. First of all, Evolution handles threaded conversations logically and effectively. When you choose to view your messages in threads, they are organized in a way that makes sense. When using the “conversation” feature in Outlook, many messages are still left out of a conversation for some reason. In addition, Outlook’s “group by conversation” simply groups your messages, rather than displaying them in a threaded manner. Evolution, however, seems to do a much better job of catching all of the messages in a thread and keeping them together. The messages are then shown in a true threaded fashion, showing which messages are responses (or children) of other messages, and indenting those messages appropriately. Evolution also includes two very important filters that Outlook is severely lacking (although, for some strange reason, one of them has always been a feature in Outlook Express). First, Evolution checks to make sure you specified a subject in your message. If you left the subject line blank, Evolution warns you, and asks you to confirm that you meant to do that. Secondly, Evolution uses a rather impressive algorithm to check to make sure you didn’t forget to attach files to your message. If it finds language in the message that suggests you meant to attach a file, it will warn you if no file is attached. Using Evolution is just as easy as, if not easier than using Outlook. Everything within the client is extremely intuitive and easy to figure out. Evolution interacts extremely well with Exchange servers, and does a great job with IMAP mail (even allowing you to sync your IMAP folders both ways – meaning that you can delete messages within Evolution, and have Evolution delete those messages from the server). I am extremely impressed with this client, and love using it when I’m not at work. I haven’t tested Evolution to see if (and how well, if it does) it works with an Exchange calendar and Exchange task lists. Since we use an Exchange server at work, and I keep my calendar (along with some shared calendars) on the Exchange server, and am an ardent user of the task list, I am a bit weary of trying Evolution at work. I will probably do so, soon, though; and I’m sure I won’t be disappointed. For those of you that have used Outlook, you will most likely be impressed at how well this free alternative performs. 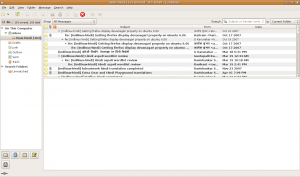 For those of you that have used Thunderbird, I think you’ll be amazed at how much more functionality, configurability and user-friendliness Evolution has. If you try it out, please report back and let us know what you think. Evo has one major weak point, you have no option to delete emails from a pop server when you delete then locally. They are either on the server, or they get downloaded to your local inbox. Thunderbird on the other hand has this option. it’s problem is that it’s a mail client and not a PIM. So if you use pop servers and you have multiple computers you use, it becomes a real pain to keep them all synced with your pop servers. This is the only criticism I have about Evo, but it is a major inconvenience.